The clash between road and rail transport is nowhere better exemplified that at Rushden. The town is the terminus of the Birch long-distance service from London, in direct competition with the railway, which runs a branch-line service to join expresses at Wellingborough. Here is one of the company's buses-familiar sights to motorists between this district and London-on the road. It is on record that a young person asked to name the most beautiful building in Rushden, replied: "Birch's bus garage." Opinions will differ, but certainly the terminal building of a service that provides seventeen buses a day to London strikes a refreshing note of modernity. And in its way it is historic, too, for the Birch family has a long history in road transport. Apart from the bus fleet of 60 vehicles, they have been running London cabs and taxis for 122 years, and in 1952 pioneered the first diesel cab. Within a year they converted all their taxicabs to diesel power, and since then the company has supplied 1,200 standard diesel engines for installation in London taxis. All this is a far cry from the 18th century, when this romance of road transport was begun by one of the family who ran the Plymouth  Exeter mail coach. Later the great-great-grandfather of the present chairman migrated to London, and a very different London it was then, for he became a dairy farmer at Westminster! His son William began running horse cabs in 1832, and after his death as the result of an accident, his widow carried on the business. She began running horse buses in 1847, and in due course her sons founded the private company of Birch Bros. Ltd. Horse buses passed from the firm's story in 1912 when, owing to the fierce competition of motor transport, the last horse bus was withdrawn from London streets. Meanwhile the company had started running motor buses, and by 1907 was operating sixteen, but later discontinued them. They resumed in 1924, and continued until 1934, when the buses were compulsorily acquired by the L.P.T.B. 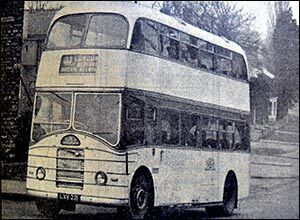 Regular daily long distance services started in 1928, when the company began operating between London and Bedford, running three buses each way daily. A year later the service was extended to provide a daily service between London and Kettering, calling at Rushden and Wellingborough. The service developed steadily, and by the outbreak of war eleven journeys each way daily were being made between London and Rushden. Since 1945 the service has again increased and the present service consists of seventeen journeys daily in each direction between London and Rushden. Latest development is that application has been made to the licensing authority for permission to extend the service further by three journeys each way daily between Rushden and Corby via Kettering.